Internationally recognized as a school on the rise, Georgia Tech Scheller College of Business develops business leaders with a deep understanding of how technology and globalization are affecting business today and into the future. Drawing distinction from its roots in a world-renowned technical research university, the College aims to become the world's leading school for business and technology. The nationally ranked Scheller College offers undergraduate and doctoral degrees in addition to Full-time, Evening, and Executive MBA options. 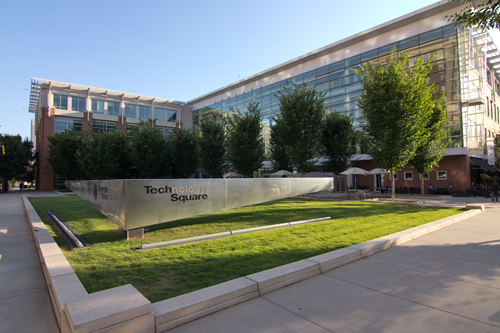 Students benefit from the College's home in Technology Square, located in the heart of Midtown Atlanta's high-tech business community. GMAT scores, undergraduate GPA, work experience, and the results of a personal interview (scheduled by invitation only) are the factors that weigh most heavily with those who evaluate applicants for Georgia Tech's MBA program. Personal essays and recommendations are also important. A satisfactory grade in a college-level calculus course is a requir...GMAT scores, undergraduate GPA, work experience, and the results of a personal interview (scheduled by invitation only) are the factors that weigh most heavily with those who evaluate applicants for Georgia Tech's MBA program. Personal essays and recommendations are also important. A satisfactory grade in a college-level calculus course is a required prerequisite for enrollment. TOEFL scores are required of applicants whose first language is not English or who have not successfully completed a year of college/university level study in the United States or another English-speaking country. Applications are processed on a rolling basis, a system that typically favors those who apply early. The Jones MBA Career Center provides “outstanding” support to assist students in developing a successful career strategy and plan. Each student is assigned a career advi­sor “who helps us find internships and jobs in our preferred fields,” a service students deem “invaluable.” Other resources include an in-depth career course, job search tools, and individual career coaching.Atlanta’s big-city locale is a plus for students in their job search, because the school “can get business heads and leaders from the city of Atlanta” to visit campus, meet with and mentor students, assist in networking, and provide internships and jobs. As one student sums up, “The program is very much oriented toward the job market, and the school is known to get 100 percent job placement. From the time you are accepted, you begin eval­uating employers and job hunting. You are given exceptional tools and resources (how­ever, you are also under a great deal of pressure to secure a high-paying job).” Among the top employers of Georgia Tech MBAs are North Highland, Bank of America, Emerson, Delta Airlines, KPMG, Capgemini Consulting, Booz & Company, Verizon Wireless, and Deloitte Consulting. Want more info about Georgia Institute of Technology, Scheller College of Business Full Time MBA? Get free advice from education experts and Noodle community members.